Coming from our tier 2 warlock set at # 22, you might ask why such a tame looking set ranks ahead of what is considered a pretty amazing (especially for its time) Warlock set. Call it charity if you want, because while many would agree that Warlocks have been the love child of Warcraft artists over the years, Paladins on the other hand have been treated like a distant cousin. So maybe the tier 1 set does not belong at 21 or even in the top 30, but I have to give it points for the “classic look” and is on par with many tier 1 sets in terms of attractiveness. 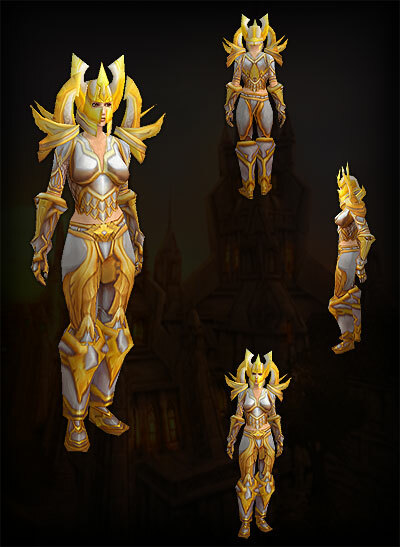 What is most funny about the set is that it was created at a time when the Horde did not even have access to the Paladin class and so its classical “holy” and “good” look barely seem workable on horde classes. Luckily for this set that only Taurens and Blood Elves have access to the class… can you imagine an undead Paladin in this set? This entry was posted on May 31, 2011 at 4:12 pm and is filed under General, MMO, Role Playing, World of Warcraft. You can follow any responses to this entry through the RSS 2.0 feed. You can leave a response, or trackback from your own site. I think the contrast would look crazy cool, a rotting undead corpse protected in shiny gold armor. Perhaps one of Arthas’ lieutenants, back to fight the Scourge.